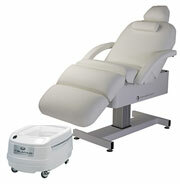 Salon Top Aspen as shown with Dual Column Electric Lift Table with electric Salon Top, Flexible Side Arms, Salon Pillow and Neck Roll, 4" Strata Memory Foam $3402 FREE US GROUND S&H /font> shown with optional Salon Top & flexible side arms, salon pillow, neck roll Aspen Salon Spa Option Package $3587+S&H Includes Aspen Salon Table with UltraLeather vinyl, Strata Memory Foam, Flexible Side Arms, Caress Face Cradle, Hand & Foot Controls. 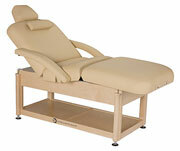 Pro Salon Spa Package all models $4352 Includes Cuvee Pro Salon, Rolling Stool w/ Back, Caress Face Cradle, Flexible Side Arms, UltraLeather Vinyl. 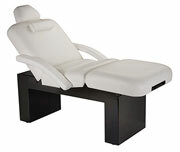 Pro Salon Resort Package all models $4523 Includes Cuvee Pro Salon, Rolling Stool w/ Back, Caress Face Cradle, Flexible Side Arms, UltraLeather Vinyl, Standard Stain or Lacquer Option. 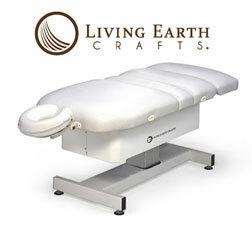 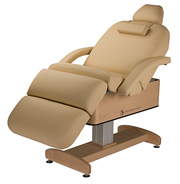 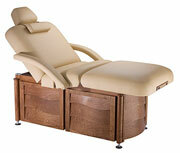 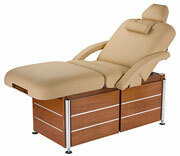 Living Earth Crafts Salon Top Aspen Dual Column Electric Lift Table with electric salon top, 4" Strata Memory Foam. 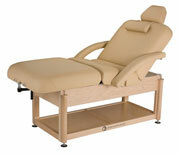 Includes heavy duty hand control. 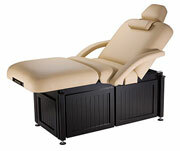 $3159 Aspen twin lift design allows you to tilt the table for laptop access and optimal relaxation and body mechanics.